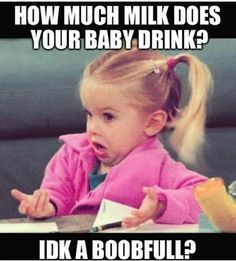 Hey, we’re not here to tell you how to feed your baby. Do whatever works best for the mama, the baby, and the whole family. FED is best. 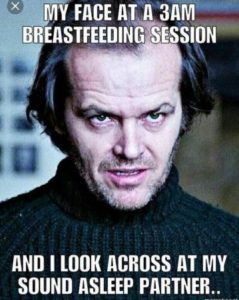 That being said, I’m not going to lie, one of the perks to breastfeeding is getting a little mental break and maybe checking your phone for twenty minutes or so. 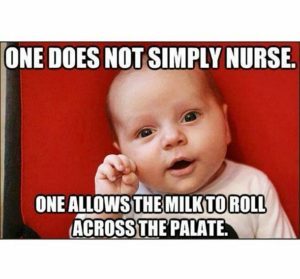 So here are ten memes that will make you giggle while you’re bonding with your cutie. Just don’t laugh so hard to wake them up. 1 – Now there’s a baby who appreciates a good meal and isn’t afraid to preach about it. 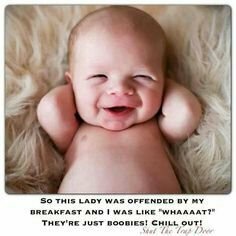 I mean really, CHILL OUT! 2 – This little fella has it all figured out. 3 – Umm, it’s kind of amazing what dads are capable of sleeping through. And even when we tried having an arrangement where dad feeds the baby, I still had to be the one who wakes up to wake HIM up. Oh well. 4 – That doesn’t sound like a bad deal to me! 5 – Whatever Victoria’s Secret, talk to me when you make comfortable and supportive nursing bras. 6 – Yeah, us mommas have the whole discretion thing figured out. 7 – Are we just raising a bunch of foodies? 8 – A boobfull or two sounds like the right amount, wouldn’t you say? 9 – Oh yeah, the perks are endless. 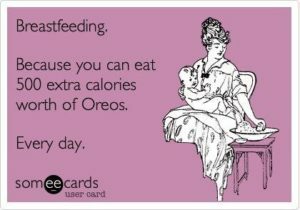 10 – That’s one effective breastfeeding advocate. Thanks honey. Okay, that should do for now! Wishing you a happy, cuddly baby!